Desktop 2 x 6 Thunderbolt Audio Interface w/ Realtime UAD-2 QUAD, DUO, or SOLO Core Processing for Mac and Windows. 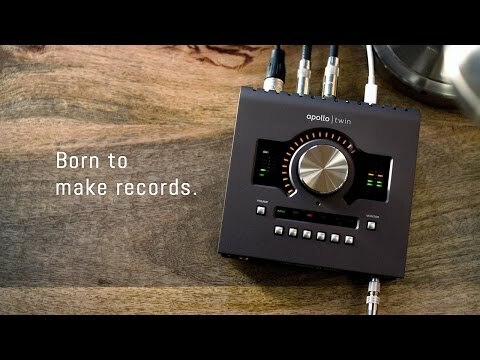 Apollo Twin MkII is a ground-up redesign of the world’s most popular professional desktop recording interface — delivering enhanced audio conversion with the tone, feel, and flow of analog recording. This 2 x 6 Thunderbolt audio interface for Mac and Windows features available onboard UAD-2 QUAD Core processing, Unison technology, and the next-generation A/D and D/A conversion you’ve heard on hundreds of hit records. A Universal Audio breakthrough, Apollo Twin MkII’s Unison technology gives you the genuine tone of the world’s most sought-after tube and transformer-based mic preamps — including Neve, API, Manley, and UA — complete with their signature impedance, gain stage “sweet spots,” and component-level circuit behaviors. Based on Apollo Twin MkII’s unrivaled hardware-software integration, Unison lets you record at near-zero latency through preamp emulations like the included UA 610-B Tube Preamp, for authentic analog sound unmatched by other interfaces. Unison technology is also found on Apollo Twin MkII’s front panel Hi-Z instrument input, providing dead-on impedance and gain matching for exclusive guitar and bass amp models from Fender, Marshall, Ampeg, and more. Building upon the Apollo tradition, Apollo Twin MkII opens up a range of classic analog tones and color via its Realtime UAD Processing. Available with a choice of UAD-2 QUAD, DUO, or SOLO Core processing onboard, Apollo Twin MkII lets you record through the full range of UAD Powered Plug-Ins — at near-zero latency — including genuine analog emulations from Neve, Studer, Ampex, API, Lexicon, Manley, Fender, and more. Right out of the box, the Apollo Twin MkII includes the “Realtime Analog Classics” suite of UAD plug-ins — the UA 610-B Tube Preamp & EQ, Raw Distortion, Marshall Plexi Classic Guitar Amp, Ampeg SVT-VR Classic Bass Amp, legacy LA-2A and 1176LN compressors, Pultec EQs, and more — so you have a rack full of bonafide audio classics already onboard.